MAR DEL PLATA, Argentina, Nov 21 (Reuters) - The search for a missing Argentine submarine and its 44-member crew was helped by calmer seas on Tuesday, but there were no new clues about its location and worries multiplied because the vessel may be running low on oxygen, a navy spokesman said. The ARA San Juan was en route from Ushuaia, the world's southernmost city, to its base in Mar del Plata and was about 300 miles off the coast when it gave its last location on Wednesday, soon after reporting an electrical malfunction. If the German-built submarine had sunk or was otherwise unable to rise to the surface since it sent its last signal, it would be winding down its seven-day oxygen supply. The Argentine military submarine ARA San Juan and crew are seen leaving the port of Buenos Aires, Argentina June 2, 2014. Picture taken on June 2, 2014. Armada Argentina/Handout via REUTERS ATTENTION EDITORS - THIS IMAGE WAS PROVIDED BY A THIRD PARTY. A crew member of the Argentine military submarine ARA San Juan stands on the vessel at the port of Buenos Aires, Argentina June 2, 2014. Picture taken on June 2, 2014. Armada Argentina/Handout via REUTERS ATTENTION EDITORS - THIS IMAGE WAS PROVIDED BY A THIRD PARTY. "Assuming the worst, that it was underwater and could not snorkel - which means renewing air and oxygen - and could not rise to the surface on its own, we would be in the sixth day of oxygen," navy spokesman Enrique Balbi told reporters. More than a dozen boats and planes from Argentina, the United States, Britain, Chile and Brazil have joined the search. Authorities had been mainly scanning from the sky as storms halted the maritime hunt last weekend. The weather improved on Tuesday, helping search efforts by sea. Wind speed slowed and waves that rose as high as 8 meters (26 feet) at the weekend diminished. 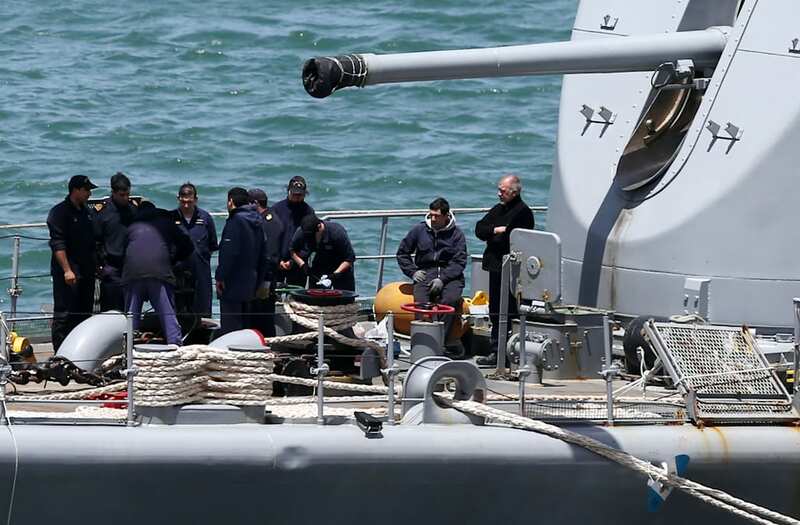 "The search by patrol ships has become more effective thanks more than anything to less pounding by the waves, which have fallen to three or four meters," Balbi said. Also on Tuesday, authorities investigated white flares spotted in the South Atlantic overnight. Searchers found an empty floating raft, and noticed the flares from a distance. But the raft's brand suggested it did not belong to the ARA San Juan, which was equipped with only red flares for emergencies and green flares for other situations, the navy said. Searchers have suffered other disappointments. Analysis of satellite signals and sounds detected by underwater probes, initially thought to be messages from the crew, has found they did not come from the vessel. "The sounds could be biological. We have discarded the possibility that it was a clanging of morse code against the hull of the submarine," Balbi said. Relatives of crew members have been gathered at a naval base in Mar del Plata, where the search is being coordinated. The ARA San Juan was launched in 1983, the newest of three submarines in the navy's fleet, and underwent maintenance in 2008 in Argentina. Its four diesel engines and its electric propeller engines were replaced, according to specialist publication Jane's Sentinel.